TweetScriber is a combined notetaking and twitter app for the iPad. While you take notes in the main window, you can also view a live feed of twitter posts matching your hashtag. As you compose notes, if you see something tweet-worthy, you can tweet just that line of notes. Or, if you see something worthwhile in the live twitter feed, you can insert it into your notes. When done, the notes are saved on your iPad, and you can export as HTML or plain text for easy posting to a blog. The asterisk (*) is your magic key for making smart bulleted lists. How do I tweet while creating notes? Start with existing text: Place the cursor in a line of text that you’d like to tweet, then click the twitter icon in the lower right hand corner. 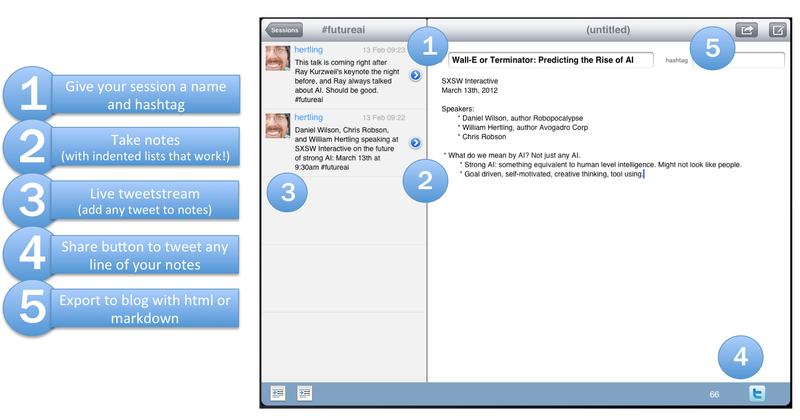 The tweet editor will open, pre-populated with the line of text you were on. You can send it immediately, or edit it first, then send it. Start a blank tweet: Click the pen icon in the upper right hand corner to start a blank tweet. How do I create and manage bulleted lists? Use the asterisk key (*) to create a bulleted list. Tab will indent, and a return (CR) on an empty line will outdent. You can also drag a line left or right to indent or outdent. Pressing return on the outmost level will end the bulleted list, and return you to regular text. How do I export my notes to a blog? The export button (the left of the two buttons in the upper right hand corner) allows you to export as plain text or html. HTML will convert your text and bulleted lists into the equivalent HTML, which you can then paste into your blog’s editor. Conversely, if you prefer to write in markdown, you can export as plain text. Click the Sessions button in the upper left hand corner, then Edit. Click the red minus sign next to any session you want to delete. Where can I ask a question or get help? Visit the TweetScriber community on Get Satisfaction.